You guys know Randy as RHPT, but did you know...? In some patients with kidney disease a complex sequence of events can cause the parathyroid glands to become overactive and produce too much hormone. This leads to an excess of calcium in the blood, most of which is drawn from the bones which are thereby damaged. 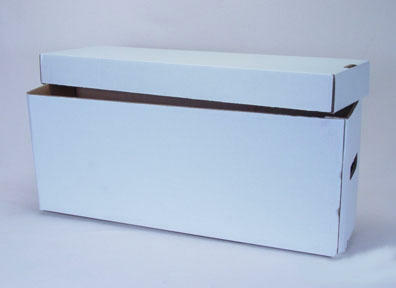 Some of this excess calcium may be deposited in other structures such as blood vessel walls where it may cause damage. This sequence of events is known as renal hyperparathyroidism (RHPT). RHPT may persist even when the original damage to the kidney as been corrected by dialysis or by transplantation. As many of you may have read, Maxwell interviewed The League just the other day. Part of the routine is, of course, that once interviewed, you should try to interview others. So I interviewed Maxwell (expect results on Monday over at Cowgirl Funk), and RHPT. RHPT has popped up quickly with his answers to my FIVE probing questions. Here, against my better judgement, I am posting Randy's responses in full. 1) You've long known Jim D. What, exactly, was Jim like in high school? Because he sounds a bit like George Will with a good record collection. Jim D. in high school was very similar to Jim D. now, except there was a lot less faux cynicism and angst. I think Jim tried very hard to be Rob Gordon from High Fidelity. In fact, he was sort of a "hanger-on" to one particular high school band that some of his friends formed. I think Jim got his pick of the looked over groupies and/or mistreated girlfriend(s). Three particular moments from high school, involving Jim sticks in my mind. 1) Days after convincing my parents to let me drive to school solo, Jim asked for a ride home. Trying to display my newfound coolness, I agreed. However, on the way to Jim's home, I was involved in a fender-bender (due to, if I recall correctly, trying to switch radio stations after Jim turned the dial). As you can imagine, I freaked out. Jim, being such a good buddy, ditched me and hitched a ride home with another friend who happened to be passing by the scene of the accident. Leaving me alone and scared. 2) During my junior year, the Journalism teacher, Ms. Cummins, was considering making me co-editor of The Oracle for the next school year. Jim, having been the sole editor during the past year, convinced Ms. Cummins to give me the title "Managing Editor" instead. 3) Jim drove a blue and white van during his later high school years. He used to tote me around town in it, and, being a van, it was fairly roomy, so I would occasionally put my feet up on the dash. Jim never said anything about it. However, once, while driving in my old '82 Celica, Jim props his feet up on my dash, leaving a big old nasty shoe mark. I got the hint. 4) In his first semester as editor of the aforementioned Oracle, Jim bored every student in the school with a 4-page insert about the 1992 Republican National Convention held at the Astrodome. (I think Jim had a press pass or something), and he followed that up with another 4-page insert about liberal elitism in the media. Heavy stuff. Of course, Jim also managed to get a press pass to the '92 Lollapalooza (you know, the good one), and out of every high school paper in the country, we probably had the best review of the concert. (To this day, I still do not know how Jim received those passes). Jim also bought most of my CD collection at bargain basement prices ("The Great CD Purge of 1992", as he likes to call it). I think I used most the money to buy comics, but I don't think that has any relevance to the question. 2) You awaken with mysterious powers. b) Would you tell anyone? c) Would you use them for good or evil? d) Would you let me give you a cool code-name? • I would probably use my powers for evil - until Emily finds out and makes me use them for good. 3) You are 16 but suddenly have all the knowledge you currently store. However, the Magic Fairy tells you that you cannot merely use this knowledge for financial gain. What three things would you do differently? 4) You get to punch one celebrity. Free hit. Whom do you hit and why? Also, head or gut? Unlike Jim, I am not opposed to celebrities. I tend to find them bemusing, and through People and US magazine, I live through them vicariously. So this is a difficult question, because there is no one celebrity that I just can't stand, no matter how obnoxious they act in public, because it is my belief that you, me, or Jim would probably act the same way if we were suddenly a famous person in Hollywood. However, if I had to pick, it would be the entire cast of Jackass, Viva La Bam, WildBoyz, and any other persons who has a show with a similar theme. Those are the most obnoxious shows on earth. I would bash them all over the head with a two-ton heavy thing. 5) What makes Randy tick? What gets Randy up in the morning? What keeps Randy from spiraling into the depths of despair? What makes Randy as gleeful as a little girl? • Randy gets up in the morning because the prospects of being poor and homeless scare him to death. • Psychotropic drugs. Lots of 'em. • In the words of Hannibal Smith, "I love it when a plan comes together"
1. If you want to participate, leave a comment below asking to be interviewed. Editor's note: You can request to be interviewed by RHPT.com, The League, or both. Anyway, somehwere in the post and comments it was decided that "Airwolf" should be the new slang for "awesome" or "cool". It's totally @#$%ing Airwolf. And apparently Dave and I watch a lot of the same crap TV. Blip #1: Well, due to the most pointless debate in the history of man I have going on via e-mail with my brother, I have no time to really blog. Blip #2: In a strange continuation of the BK Chicken Fry Taste-Test Challenge, it appears that suburban rock gods, Slipknot, are suing Burger King. It turns out that Slipknot uses costumes and stuff when they sing. And, apparently, nobody ever did this before. Not Gwar, not Kiss, nor Alice Cooper or Marilyn Manson or the cast of Starlight Express. Read up on the case here. Why do I hope this is the first case Roberts has to hear if he's confirmed for the Supreme Court? Also, thanks to Jim D for the link. This really should have wound up on Nanostalgia. Would have made for a good entry. Blip #3: Randy sent me the answers to the 5 questions I sent him, and, Leaguers, this is good stuff. Unfortunately, for some reason, Randy sent his answers in a PDF file, and I can't seem to extract the copy out as text. I keep getting weird, garbled code when I try to copy and paste the interview. Let's hope Randy is willing to send the interview back as .txt or something. Blip #4: Maxwell is also answering 5 deeply probing questions. But she also shot my first question back at me. a) What is the one question you are praying to God that I am not going to ask? b) What is the one question you're sort of secretly hoping I'll ask? Answer A: Well, after having watched The Office last night, I must turn to the question posed by Michael Scott on last night's episode of the office "Okay, real quick. Let's all go around the room and name another race we're sexually attracted to." See, that would have been awkward. Honestly, asking me anything personal about my lovelife prior to Jamie probably would have had me choosing my words very, very carefully. Answer B: I don't think I had one. It's nice to have questions to stroke your ego, and the wide and varied questions regarding high school gave me enough of a chance to talk about myself in minute detail, and if I didn't want to do that, would I be running this site, let alone asking to be interviewed? I dunno. Something about career, maybe. Only my job doesn't make for good reading, so I don't know. The League can take a hint. No more posts on how we organize our comics. 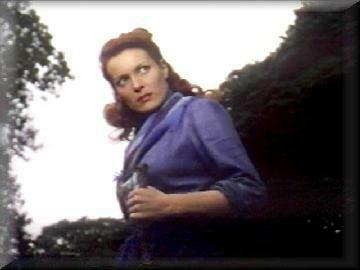 Ah, Maureen O'Hara. It may have been in Miracle on 34th Street that I first noticed you, and that hung-over Sunday morning in San Antonio when I tried to make it through Against All Flags that I noticed you could poke out my eye with a cutlass, but it was your role as Mary Kate Danaher in The Quiet Man that won me over. In Miracle on 34th Street, Maureen plays what we in the business call a "Yummy Mummy"
Sure, this DITMTLOD is a little different as it doesn't focus on a TV character from my youth, but this is my damn blog, and if I want to talk about Maureen O'Hara, by gum, I'm a gonna do it. 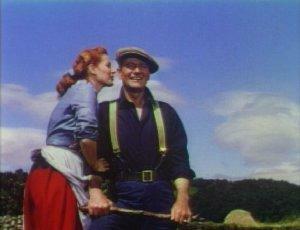 Released in 1952, The Quiet Man tells the tale of a boxer born in Ireland who immigrated to the US as a child. The boxer, Sean Thornton (played by John Wayne), has ended his career for mysterious reasons and chosen to return to his family's home in Ireland. 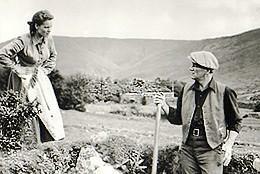 Here, Thornton meets Mary Kate Danaher and has to adjust to the local Irish customs in order to woo her. The movie is directed by the legendary John Ford, and while it's not a western, Ford certainly handles the material with his usual flair. Really, it's a very fun movie and was recommended to me by my high school biology teacher, Mr. Bryant, who I owe a lot to. Mostly, I thank Mr. Bryant for not sending me to the principal upon the numerous occasions when he had very, very good reason to do so. Every Irish stereotype you can think of is trotted out for the movie, and lovingly embraced by the Irish actors playing all the major roles. 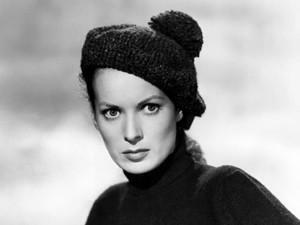 It should also be mentioned that Maureen O'Hara actually is from Ireland, so the casting there was quite intentional. 1) While not a brunette in a form-fitting one-piece uniform, Mary Kate manages to make a blouse, skirt and smock look very nice. 2) Mary Kate ain't afraid to slap around John Wayne. Mary Kate is given to fits of wild temper, which, we learn, may be why she ain't quite landed herself a husband yet. These fits of temper tend to lead to some plate throwing and whatnot, but it's all in good fun. 3) Mary Kate has a fun family. Sure, the conflict between her brother and John Wayne is a major part to the story, but it just goes to prove there's nothing a few pints and an extended slugging match can't settle. 4) Mary Kate is multi-talented. From herding sheep to more domestic chores, Mary Kate seems to be a quick study. 5) Responsible for one of the greatest screen kisses of all time. Sure, Spielberg actually referenced it frame for frame in E.T., but there was a reason Steve-o picked that particular scene for his movie. I hate to give away the context of the scene, but with a storm blowing through the doorway of their new cottage, Sean and Mary Kate pretty much seal up the running for best culmination of romantic tension. Sometimes romance ain't all puppy-tails and flowers. Ah, but she's a ravishing red-head, she is. 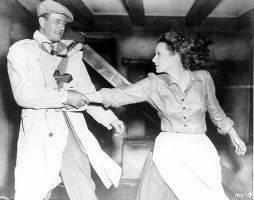 I'm not sure what category The Quiet Man falls into. Romantic comedy? Romantic dramady? I want to point out that this movie isn't a western, it doesn't have a single ape, superhero, robot or starship in it, and I still find myself watching it over and over. The League highly recommends this movie. Wayne and O'Hara re-teamed for the comedy-western McClintock!, which is a pretty good movie right up until the final scenes where you really, really start to feel uncomfortable as a 21st century human being. The movie was, I should add, filmed in AZ. 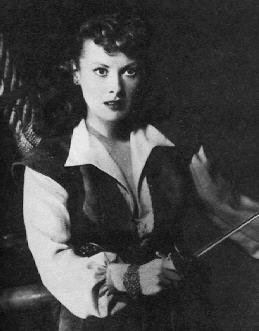 For the previous "Dames in the Media the League Once Dug", click here.